The award-winning BCB features a new contoured shape & updated materials to create a more thermally-efficient backcountry experience...all at a lower weight. The backcountry bed is awesome. For everything other than crazy cold or wet it is perfect. Its comfortable, light and better than any bag I've ever used. I've spent hundreds of nights camping and have never once used a bag that made me feel so comfortable. I can control my temperature and move around without having to wake up and unzip my bag. This bag is incredible and I'm sad I just now bought one. Do yourself a favor and buy this bag and never look back. Super light and Keeps you warm! Recently purchased this sleeping bag for backpacking. 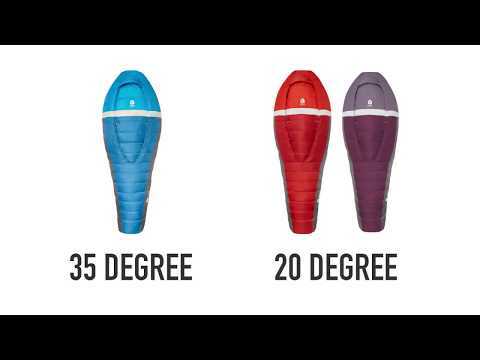 After researching both this sleeping bag and the cloud 20 i decided on this one as i am a side sleeper and this looked like it would be perfect for me. The weight is slightly heavier then the cloud 20, but this bag is worth it. Recently slept with it in about 34 degree weather and was toasty warm all night. Using the cords to secure the bag was perfect i switched from side to side throughout the night without the bag dislodging and making me cold. I do recommend a decent sleeping pad as there is no down in the back area (for good reason as you would just compress it), i am using a reflective sleeping pad with a 4.9 R rating and it does the trick nicely to keep me warm. Finally! A sleeping bag that stomach and side sleepers will love! Just used my bag for the first time in Yosemite last night. When I first got a look at it in person I thought, "Oh oh, it's a little mummyish in shape". I cannot sleep in mummy bags. Way to confined. (If it wasn't for quilts I'd have a very hard time sleeping in the backcountry. I use the Sierra Designs Backcountry quilt 30 degree 800 fill.) I was a little anxious during the hike up to the top of Yosemite Falls wondering if I'd be able to sleep that night? Especially since it was going to be much colder than we anticipated that. We were expecting a low of 41 degrees, it actually got to 18 degrees. I would've never believed that until my friend came into my tent at 3am because he was to cold in his hammock. I was actually sweating a bit. (I was wearing long underwear.) I released the bungee cord that keeps the comforter in place and was really surprised how well the comforter seals in the heat. It also made sleeping on my side no problem at all and very comfortable. I was as comfortable on my stomach as I would be using my quilt. I was even able to bend my legs comfortably. I use a 2.5 inch thick 20R for a pad. The fit was a little snug, but it still only took me 10 seconds to slide my pad in. That reminds me about one of the best things about the bag. It stays put on your sleeping pad. So nice not having to do the nightly readjust. The bag is also compressible. It was in a 15 liter compression sack with my puffer, 2 pairs of socks, beanie, and long underwear (top/bottoms). I still had about 6 literally left to use in the sack. I was able to lay the bag sideways at the bottom of my bag. It made for a perfect base. It is a 65 liter bag for reference. Will Never Buy Another Bag!